For all of you who just got engaged, here’s a chance to research lots of wedding info in one place! Your venue should be your first decision so stop by and talk with us about how our beautiful house and grounds might suit your vision for your ceremony and reception and/or for your rehearsal dinner. Show times are 11-4:00 on January 6 & 7 at the Jim Graham Building, NC State Fairgrounds in Raleigh. Look for our booth on the 300 aisle in the middle of the show. 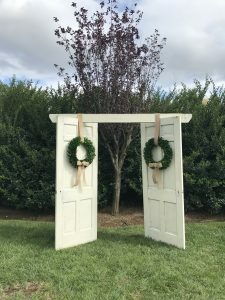 You’ll find us hanging out around this vintage ceremony arbor with lots of pictures and answers to your questions. Click here for show details. Hope to see you there!